Ludd's Mill - ZineWiki - the history and culture of zines, independent media and the small press. Ludd's Mill was a fanzine edited by Andrew Darlington. It began life as a community alternative and was 'rescued' by Darlington . It was released in the 1970s and 1980s in Ossett, Yorkshire, UK. The article "DIY'ing in the Bedroom - Yorkshire's Fanzines", from Ayup! Magazine, says, "Ludd's Mill, from Ossett, was an intelligent 'zine, the brain child of Andrew Darlington." 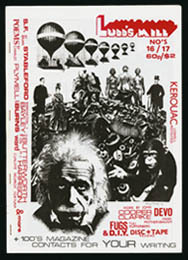 Ludd's Mill featured articles on various aspects of alternative culture, including music, art, books, fiction and poetry, with features on bands such as Devo, and The Fugs, among others, as well as reviews of books, records and tapes. Contributors included Trevor Ball, Peter Barnfield, Barrington J. Bayley, Robert C. Boyce, Jeff Branin, Charles W. Bryant, Jim Burns, Michael Butterworth, Barry Chamish, John Cooper Clarke, Kevin Cole, Burton Connors, A.K. Cumberlidge, Dave Cunliffe, Susan Darlington, Keith Dearne, Kurt S, Denkena, Kieth Dersley, Blackie Fortuna, Katherine Gallagher, John Gonzales, Steve Harrison, Gordon Hendry, Joe Hirst, David Jacobs, Allan Jurd, Michael Kelly, Crad Kilodney, Arthur Winfield Knight, Tuli Kupferberg, Dinah Lawrence, Martyn Lowery, Ulrike Pallach, P.E. Presford, Jerome Salzmann, Steve Sneyd (Data Dump), Brian Stableford, S.C. Tonkin, Mark Valentine (Aklo), Tom Whalen, Tim Wyatt. Artwork was contributed by Harry Turner (Zenith, Now & Then, Zimri). This page was last modified on 22 February 2016, at 04:27. This page has been accessed 14,424 times.